Home > Article > Indenture: A new system of slavery? 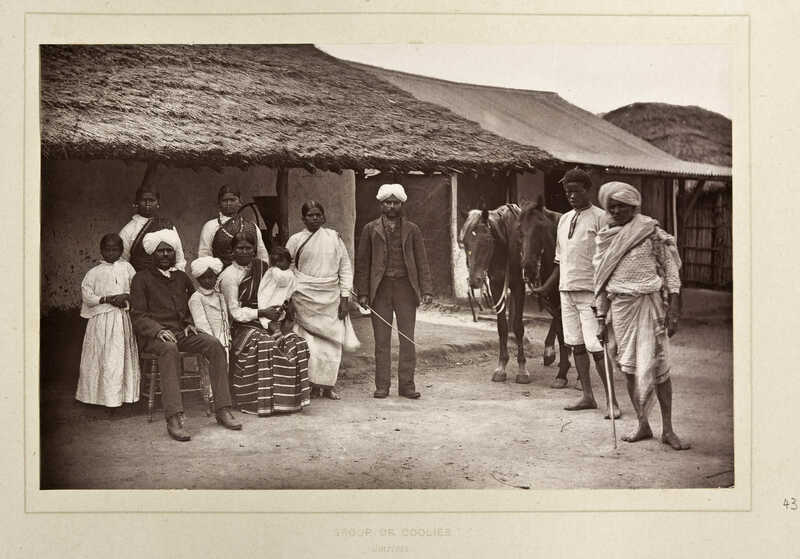 An Indian family in Natal circa 1888. Images source: The Collections Library of the South African Parliament. Was the system of indentured Indian labour "a new system of slavery"?as Hugh Tinker entitles his book? The answer would depend on how the reader defines the word "slavery." In ancient times, for example, under the Romans, a people defeated in war were usually taken over by the conquerors as slaves. The men were imprisoned and assigned to hard labour, where most of them died, while the conquerors absorbed the female population. In more recent times, one tends to think of slavery in terms of the capture of people from West Africa who were taken by slave-traders to America or elsewhere. These slaves were tied, chained or even yoked to wooden poles and taken against their will to boats where they were herded together like cattle and then transported across the sea. Many never reached the end of the journey where the survivors were auctioned to the highest bidder, and subsequently subjected to the most inhuman treatment, there being no laws to protect them. If the slave married a slave woman, his children were also subject to slavery. Slaves had no rights whatever, and were subjected to merciless punishments and worst of all, could never obtain freedom for himself or for his children unless "set free" by his master. Both of these descriptions are not applicable to the indentured Indian because he voluntarily contracted his labour for a specific period, and under specific conditions, for example, salary, accommodation, rations and free travel to and from India to the country where the worker was assigned to go. By Law 14 of 1859 (in addition to subsequent legislation) the British Government introduced labour regulations for employers of Indian labour as well as for employees. While legislation was essentially designed to protect the Indian immigrant, the execution of the law was not always strictly enforced and in the case of Natal, there were employers who defied the law and subjected their employees to a type of Lynch?s law. The Revd W. Pearson who was sent by the Government of India to Natal in 1914 to act as an "observer," was a more impartial critic, but even he commented that "the laws afford him (the indentured Indian ), no adequate protection, either in principle or in practice." The first aspect which grieved Polak was the discriminatory attitude held by Whites towards Indians. ?Sammy," a common method of addressing an Indian of the labouring classes (said to be an abbreviation of Ramasamy" and similar names), remained very much the second class citizen when it came to travelling on the railway and the tram-cars. He was not permitted to walk on the footpaths (pavement) and the petty arrogance of the lower White officials caused him much irritation, humiliation and bitterness. Hotels did not offer any accommodation for Indians, despite the fact that Indians were rate payers of Durban; they were prohibited from using the municipal baths and the children's paddling pool on the beach. Polak regarded "famine and want" as the best recruiting agencies. Further, the "ignorant labourer, in penury and starvation" is led to believe before migrating about the "El Dorado tales of South Africa." What does he understand of the contract? What does he know of the laws and social conditions of Natal? A point on which both Polak and Pearson appear to have been in agreement was the fact that when the labourer was engaged in India, he had no knowledge of the type of work he would do in Natal or who his future employer would be. Certainly after 1895 very few were aware of the £3 annual tax.
. . . "over-long hours of toil, the most arduous drudgery, ill-use, climactic differences, insufficient food supply, temptations to immorality, petty fines and punishments." The "Coolie marries" were prostitutes and immorality prevailed, partly on account of the non-acceptance of Indian religious marriages and partly through an absence of any social, religious or educational upliftment. ... "a mere chattel, a machine, a commercial asset to be worked to its fullest capacity, regardless of the human element, careless of the play of human passions. The system lends itself to heartlessness and cruelty, if not on the part of the employers, then on that of his sirdars and overseers." "The Indian labourer is often regarded by his employer as of less account than a good beast, for the latter costs money to replace, whereas the former is a cheap commodity." Law 25 of 1891 made conditions increasingly difficult for the labourer. Section 25 stated clearly that he could be employed on a Sunday morning up to 8 a.m. "for the care and feeding of animals." However, the law was ambiguous and gave an unscrupulous employer an unfair opportunity to obtain additional labour from his employees. According to Section 26 the employer could be fined up to £2 for failing to observe the clause "up to 8 a.m." On the other hand, if the employee failed to work as requested after 8 a.m., he could be subjected to a fine not exceeding £1. Section 36 could impose a fine of £5 (half a year's wages) or thirty days imprisonment for "gross insolence, fraud or damage to employer's property." Section 40 stated that the indentured Indian could be transferred to another Estate (subject to the approval of the Protector), a fact which Pearson considered to be "perilously near slavery.? These and many other regulations, provide proof that during the last 25 years of indenture, the labourer had "no adequate protection," and in any case, it became so complicated and tangled in legal jargon, that in most cases, the Law was beyond the reasoning capabilities of an illiterate peasant. Statistics from the Annual Reports of the Protector for the years 1903 to 1908 reveal that the employers' complaints against their labourers far exceeded the complaints by labourers against employers. Thus, according to Polak, in the first category we find: 5769 labourers were absent without leave or without passes, of these 46 cases were discharged, while 17 were withdrawn; 7767 were absent from roll-call and accused of disobedience, of these 472 cases were discharged while 362 were withdrawn; 1600 labourers left their Estate "in a body;" 135 labourers assaulted their employers; 36 cases were discharged and 362 were withdrawn, making a final total of 15,611 complaints. As to the complaints by immigrants: 120 lodged complaints against their employers, of which 37 cases were discharged while 42 were withdrawn; 85 managers and sirdars were accused of assault, of which 26 cases were discharged while 42 were withdrawn; finally, 14 employers failed to provide medical attention, 3 cases were discharged and 17 withdrawn, making a final total of 374 complaints. The reason that the employees' complaints appear so low becomes obvious when the laws relating to "lodging a complaint" are examined. According to Section 30, Law 25 of 1891, if a labourer was found to be more than two miles from the place of residence of the employer, without written leave and was on his way to lodge a complaint with the Protector, he could be apprehended and arrested by a policeman or any other higher official. Under Section 31 he could be arrested as a "deserter," unless he could produce a "Pass" or his "Certificate of Discharge." In this instance he could be taken to the Magistrate and fined 10 shillings or serve punishment with hard labour for seven days. For his second offence, he would be punished and serve 14 days, while for a third offence, he would have to serve 30 days. Expenses for his return to his employer would be deducted from the labourer's wages. If the labourer managed to evade the police and succeed in reaching the Magistrate's offices, he had to convince the Magistrate that his complaint was not "frivolous." If the Magistrate was not satisfied and refused to grant him a pass to proceed to the Protector, the labourer would be fined (and/or punished) and returned to his employer. It must be added that all the days the labourer spent in gaol were ultimately added to his working term before his contract could expire. If the Protector accepted the labourer's disposition (for example in a case when his employer had brutally assaulted him), then the labourer "shall be returned to the employer before the complaint is investigated." If there was some irregularity and the Protector was not satisfied, then he could hand the labourer over to the Magistrate, where he could be committed to gaol, fined or punished and returned to the employer. If the labourer refused to return to his employer, he could be sent by the Protector to the magistrate who would impose the previous punishments. "In most cases therefore, if the labourer desired to lodge a complaint against ill-treatment to the Protector and attempted to obtain compensation and redress," he invariably found himself imprisoned and punished "for having dared to seek justice without first obtaining permission." "This is the most scandalous provision extant on the British Statute-book anywhere. What if these unfortunate wretches have to ask permission to go to the Protector's from the very man they propose to complain against? Is he at all likely to grant it? Indeed, if not, are they to endure on in patience? This section alone is enough to damn the whole Act." Section 101 of Law 25 of 1891closed the possibilities of a large number of labourers who absented themselves without leave, to complain to the Protector, in which case "they may be brought before any Court and on conviction be punished and fined £2 or imprisonment for two months irrespective of the nature of the complaint." Polak's conclusions about the Protector and the Magistrate are realistic. He says, "The Protector should be independent," but states that this official very often "becomes the guest of the employer on his tours." As to the Magistrate, he is "born and bred in an atmosphere of semi-slavery and tainted with the Colonial prejudice against and contempt for the Indian labourer." Quite possibly, the Magistrate was a friend of the employer and more likely, even an employer himself. Under these circumstances, "What chance of redress has the complainant?" Further, under these circumstances, would suicide not be the only solution for the unfortunate victim? "He (the Protector) makes the assumption, which so many prejudiced Europeans make, that any complaints or evidence put forward by Indians is not to be trusted. He seems to interpret the principles of British justice in a way that assumes all the Indians to be guilty until they are proved to be innocent and all employers of Indians innocent until they are proved to be guilty. And the burden of proof he leaves to the illiterate Coolie whose very language he is unable to understand.? If we compare reactions by previous Protectors, then it becomes obvious that by 1914 there was complete indifference on the part of the Protector to protect the weak and seek justice. By this time too, as a result of the Government's desire to economise, the Reports of the Protector were no longer published. 'The penalty is usually quite disproportionate to the offence, whether European or Indian be the accused. But too often it appears that there is one law for the European employer and another for the Indian." Polak singles out the family of T.B. Robinson of Cato Manor as being of "evil repute" because Robinson senior, his wife, and Robinson junior, were all convicted of offences of ill-treatment against their employees. In the case of Ragavalu (No. 105 396), he had already lost his left hand and had been to the Protector seven times to complain and was eventually rebuked and punished for attempting to commit suicide. Three servants of Sydney Robinson had just served a gaol sentence for refusing to return to work. When they came out, they still refused to return and an infuriated Master Sydney attacked them with a sjambok. The "sympathetic" Magistrate cautioned and discharged Master Sydney, advised the Indians to return to work and commented that, "he knew how aggravating and tantalising they (the Indians) could be!" In the case of Altsch versus Ginganna, the employer had set his dog upon the labourer. The evidence was clear and Altsch was fined thirty shillings. The Magistrate, commenting on the frequency with which Indians complained against ill-treatment by their masters, said, "This sort of thing must be stopped." In another case, the Magistrate commented that "if these indentured men had not the protection of the law, their life would not be worth living." This indeed was the case in the so-called Thornville Junction Case, where Messrs Leask, Senior and Junior, were accused of punishing their servants by various means of torture, which included "being cooped up in a box 6 feet by 1 1/2 feet by 1 foot for varying periods" (from one to eight days) without food. Here it was said that the "Coolies live in mortal fear of their masters." The Leasks were subsequently deprived of their labour by the Protector. In the case of Noyle of Ramsay Collieries, Ladysmith, Devi Singh was so severely assaulted that the Deputy Protector immediately ordered him to hospital. The Magistrate however took a "mild view" and fined the assailant £2-10. Perhaps one of the most callous instances of inhumanity was when Armitage in a premeditated attack cut off the lobe of the right ear of his servant and thereafter proceeded to dress it. In sentencing Armitage to a £20 fine, the Magistrate remarked. "The Robinsons could not even find it in their hearts to treat their servants as they would expect good cattle. What hope of justice can an indentured Indian expect from such a Magistrate." A tragic family case was that of Ramasamy and Poli who "lived together" (i.e. they were not lawfully married) and had two small children. For some trivial offence, his employer P.D. Simmons "tied him up to a nail in the wall and whipped him until the man's back was one mass of raw and quivering flesh.? That night Ramasamy fled with his family. He reported the incident to the Magistrate, who ordered him to return to his employer, whereupon he went to the Protector, who also ordered him to return to his employer. In the meantime Simmons had reported his servant's desertion and Ramasamy and his family were arrested at the Protector's office. Ramasamy was returned to his employer, but nothing was ever heard again of Poli. Ramasamy could not claim his wife as according to Section 71 of Act 25 of 1891, they were not legally married. This particular case was raised in the House of Commons. Simmons was fined 10 shillings, but the case also aroused deep interest among the Natal press, officials and Colonists. Another tragic family case was that of Mudaly (No. 116821) and his wife Odda Nagi (No. 116838), who although they were employed as domestic servants, received the rates of pay as for field labourers. His working hours were from 4 a.m. to 9 p.m. with two half hour breaks, while hers were from 6 a.m. to 7 p.m. The elder child was 2 1/2 years old, and all day was tied to a peg in the parent's hut for safety, until the day's work was over. When a second child was born, and a week old, the employer refused to allow the mother to bring the child to work. Fearing the child would starve, the mother gave the child away to foster-parents; the child died of neglect. Complaints to the Protector were of no avail. According to the terms of indenture, the law prohibited the separation of man and wife and their children. Further, there was no provision for the prevention of separation after allotment. On a particular Estate, Muthialu, the sirdar, paid unusual attention to Valiamma, the lawful wife of Padiachy. When the latter complained about this to his employer, he was thrashed and transferred to another estate, but without his wife. The employer sent Muthialu and Valiamma to the Protector to register their marriage. Three years later after the birth of children, the Protector charged Valiamma for bigamy and in November 1907 fined her £5 which Muthialu willingly paid. Indentured labourers also had to be very careful when giving any evidence, a factor which has already been emphasised repeatedly, for fear of being accused of perjury and sentenced to imprisonment. Finally, to conclude Polak's list of cases, the author refers again to the couple of "evil repute." T.B. Robinson assaulted Rambally (No. 128349) so severely that for six months thereafter, he was unable to work and was finally shipped back to India as a cripple, leaving his wife and child unprotected. A few days after giving birth to a child, his wife was assaulted by Mrs Robinson. and no doubt succeeded in getting his point across to his reader, namely, the increase in assaults and ill-treatment of labourers was a prime cause of "desertion." "It is a physical impossibility for the Protector or the estate Medical Officer to completely control abuse on the part of the employers."
. . . "So long as the laws remain as they are, no official can properly protect the indentured Indian labourer." "The callousness of some employers and managers is appalling; they look upon their servants as animals and treat them rather worse than such." "Cattle and dogs may be well housed and well fed and even kindly treated as animals, but for men and women we require something more than conditions such as are satisfactory for cattle." Cases of assault (and consequent injury) to labourers continued to go unreported because the law operated in such a way that the truth was often suppressed and Indians came to the conclusion that they would be safer as "unwilling witnesses." The Protector was aware that with his reduced powers, he became increasingly powerless to act in the interests of the Indian. After 1900 he complained that he could not afford complete protection to the indentured Indians particularly when they were scattered over thousands of square miles. Referring to the composition of the "Board" he remarked, "It is when the employer domineers over the Indian Medical Officers, that the Indian suffers,? and that such a Board, should in no way "influence the treatment of the indentured Indians in the Colony." Commenting on the high death rate, he stated, "employers continue to be careless and the Indians suffer accordingly." As "father and mother" to some 30,000 Indians, he was also aware that the number of punishments for trivial offences had increased considerably, and remarked, "a little more sympathy on some estates, and better results would accrue." He even felt that the "won't work" group could be humoured rather than imprisoned. Like all other aspects of indenture, medical rules also changed constantly. Bill No. AB 74/1909 and Act II of 1910 amended Law 25 of 1891. Henceforth, employers with up to 400 employees paid up to £30 per quarter, i.e., £120 per annum, while those with 400 or more, paid ££ per quarter, i.e., £160 per annum for medical fees to the Trust. Polak's only reference to child labour was the fact that in the tea factories, young children were working eleven hours per day. However, the Revd Pearson exposed several weaknesses in the system as regards child labour. According to the Protector, although children were "not legally bound to work, in practice they are." This statement summarizes some of the ambiguous regulations that no one appeared able to interpret. The law laid down that "women were to be paid half wages and minors in proportion." Many plantation owners considered that the children were actually under indenture. This meant a boy's wage could vary from 5 to 9 shillings per month (depending on his age), with an increase of one shilling per month per annum. Thus a boy aged 10 would receive 2 pennies for nine hours work per day. Only a few Estate owners established schools and often children were forced to work, when their parents actually desired them to go to school. In this respect many of the sirdars forcefully took boys away from the schools in order to work on the Estates. The question of rations for women and children was another aspect on which clarity appeared unobtainable. On some Estates the employers preferred women labour, because they "can be treated with more impunity than the men and do two-thirds as much work." Polak objected to women doing hard manual labour, such as feeding cane-rollers, cutting cane or lifting bundles of cane on to trucks. Apparently this practice existed in other Colonies, and Polak sincerely hoped that "this system of forced labour," on women would be abolished. Generally speaking, the system of indenture was basically evil where the labourers "are completely at the planter's mercy." Regarding the planter, the system "kills whatever decent instincts he had and turns him into a cruel and remorseless slave-driver, for it is slavery and nothing else." There are few accounts of indentured Indians being repatriated and still fewer accounts of the return of "wastage" (i.e. unfit workers). Fortunately, M. MacMahon, an ex-planter who sailed on the Umfuli on 26 September 1906, was able to provide an account in a Madras newspaper. The Umfuli, a vessel of 2300 tons, was packed with 653 passengers whom the writer described as "a disgrace to civilization." The passengers, men, women and children, were "huddled together, without any separation of sexes." Some of them, "were invalids and in a pitiable condition and ought never to have been allowed to leave the hospital." Many were ill with terrible diseases and "the best that was in them having been taken out of them" and quite simply, "they were packed home to die." The writer's final impression was that, "The slavery there (in Natal) under the British flag is indeed worse than the slavery under the Sultan of Zanzibar."
. . . "The law is silent in this connection, but the Board's legal adviser is of the opinion that the Indians have no claim." In other words, while the rules for emigration from India (e.g. Act XXI of 1883) were implemented, the same law contained inadequate provisions for repatriation. On account of deteriorating social conditions in Natal coupled with the fact that so many were unable to pay the £3 annual tax, in addition to a £1 tax per year, many were faced with unemployment, imprisonment and starvation. As a result, when advertisements appeared for the Benguella Railway project in Angola, about 2,250 Indians applied, and were shipped in March 1907. Their contract stated that after service, they would be returned to Natal, free of cost. The experience turned out to be most unfortunate, because according to the Indian Opinion, half the labourers died during the first three months in service. In addition to the non-provision of tents or any other kind of shelter, there was a desperate shortage of water. For months the workers were unable to wash and many succumbed to fever. Living conditions were filthy, there were no medical facilities, and food was scarce. As if this was not enough, when the labourers returned, 948 of them were prohibited from landing in Durban. Relatives and friends in Durban were not given permits to visit them. According to the Government, they were "not domiciled" and would be repatriated "against their will, penniless and friendless back to India without being given the opportunity to prove their domicile." According to available evidence, the Indian Government broke its rules regarding emigration to non-British countries, because it believed that "the Coolies' interests would be safeguarded." Subsequently it warned the Government of Natal . . . "that both contracts are also open to objection in that they do not make provision for maintenance during sickness or for compensation on account of injuries received." "The Colony of Natal got rid of about 1500 of its Indian population, partly by death, partly by deportation, because the poor wretches could not pay the dead-weight of taxation that was attached to them as the price of freedom," and concludes by remarking that after this fiasco, no more British Indian labourers were assigned to areas outside of British South Africa. ... "strongly urge the stoppage of indentured Indian immigration to Natal, under the present state of the law, which reduces indentured labour to a form of slavery."
. . . "Neither were they aware of the hardships and disabilities they would have to undergo here as indentured or free Indians."
. . . "their position under indenture was so miserable and the necessities of life here are so dear, that your petitioners are virtually unable to save any sum in order to enable them to go back to their country after the expiry of their indenture, or to pay the £3 tax, should they choose to remain in this Colony after giving the best years of their lives under indenture.? "unprecedented and contrary to the principles of justice and quite repugnant to the British idea of freedom and liberty." In one notorious case, a woman in Stanger was imprisoned and her hair shaved off because she could not pay the £3 tax. Polak reported that since that incident, the Natal Government gave instructions that no female Indian prisoner could be subjected to such treatment except on the specific instruction of the prison Medical Officer. "There is no precedent in the legislation of any other country under the British flag where women are taxed for the privilege of living with their husbands or under the protection of their natural guardians." "The Law is an unprecedented one in the history of the world and it is repugnant to British justice to impose a tax upon women and girls to live with their husbands or natural guardians." Unfortunately the date on the archival document is illegible. Under Act 42 of 1905, Indians could gain the right of a free return passage to India, if they re-indentured for a further two-year period. As a result of the iniquities of the £3 tax, many were forced to re-indenture. For example, in 1908, out of 7 735 who had served their five-year term, 3 304 re-indentured (i.e., 43 per cent) about 50 per cent returned to India while the rest became "free." Thus we see that only a very small percentage could "afford " to pay the £3 tax. Under the five-year plan, it was impossible for the average indentured Indian to save any money. Polak estimated that under the average five-year period, savings had declined from £1 6-7-6 in 1904 to £5-5-2 it 1907. Previously under a ten to eleven year stay, it was possible to save a considerable amount, especially during the time one was free. The Protector of Indian Emigrants in India estimated that while average annual savings in 1907 in Mauritius was about £4-18-2, and in Jamaica about £4-14-8, in Natal it was among the lowest at £1-1-2.144. Another contributory factor was that although under Act 17 of 1895 the wages for re-indentured Indian was stipulated to be 16 to 20 shillings per month for each succeeding year of service, in reality man3 employers paid only between 10 and 14 shillings.
. . . "What is it but taking the best of our servants and then refusing them the enjoyment of their reward', Forcing them back when their best days have been spent for our benefit"? "Natal while closing the front door upon Asiatic immigration, opens the back door for its further artificial introduction, contrary to the wishes of the Indian community," referring to the different attitudes held in Natal towards "free-passenger" and "indentured" immigrants. In short, there was only one way to rectify the evil, and that was to stop indenture altogether. "Repatriation ... is the only solution which would be completely satisfactory to the white races in the sub -continent." After Union it was the National Party under Dr Hertzog which relentlessly pursued this theme at the Cape Town Conference (1926-7), and at the Second Cape Town Conference (1932). Finally in 1960, exactly a hundred years after the arrival of the first Indians, the South African Government finally accepted, rather reluctantly, that the Indians were citizens of the Union of South Africa. "It took a long time before either the Indian or the Colonial authorities would admit that most of those who returned (to India) had obtained little benefit from their exile." • Henning, C. (1993). The Indentured Indian in Natal (1860 - 1917), p102 - 105 New Delhi, India: Promilla & Co.